"As a fighter, you want big fights. You want to be involved in all the fights that people are talking about"
Jordan Gill wants to break into the world rankings as the exciting prospect believes he can compete with the star names at featherweight. The unbeaten 24-year-old faces Emmanuel Dominguez at the top of the JD NXTGEN bill on March 2, live on Sky Sports, with American Anthony Sims Jr and Richard Riakporhe's cruiserweight clash against Tommy McCarthy on the Peterborough undercard. Gill can capture the WBA International title, propelling himself among the WBA's top contenders, and he is eager to push on with his career after claiming the Commonwealth title in his last fight. I want to move on to world level, and this fight puts me in the mix, in the top 15 with the WBA, and we can pick a route towards a world title. "That's what it's all about," Gill told Sky Sports. "I didn't get into boxing to become a Commonwealth champion, even though I'm over the moon to be a Commonwealth champion, it's not the end goal. "I want to move on to world level, and this fight puts me in the mix, in the top 15 with the WBA, and we can pick a route towards a world title." Josh Warrington has become Britain's leading 126lb fighter, having retained his IBF belt with a points win over Carl Frampton in December, and the Leeds man has been ordered to make his next defence against Sheffield-based Kid Galahad. 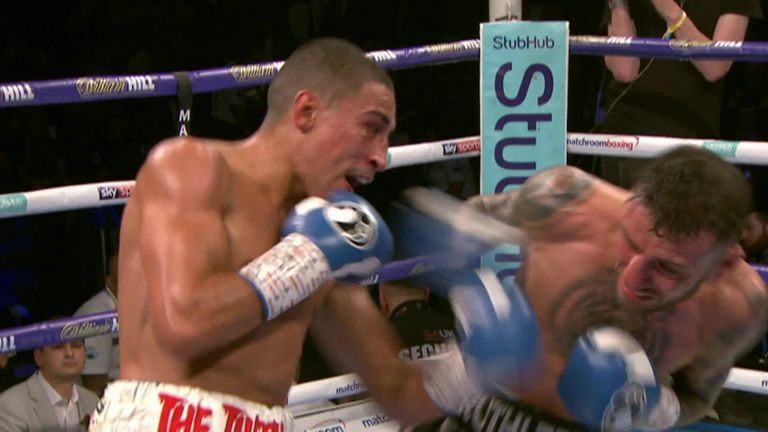 Leo Santa Cruz, Oscar Valdez and Gary Russell Jr sit alongside Warrington at the top of the weight class as world title holders, but Gill is inspired rather than daunted by these elite champions. "As a fighter, you want big fights," said Gill. "You want to be involved in all the fights that people are talking about. "Not many people are talking about divisions other than the featherweight division, because it's probably the best division in boxing at the moment." Asked if he can reach the very top, Gill said: "One hundred per cent, I'm confident that I will be there, and be there quicker than people imagine. "I'm taking one step at a time. I'm fighting one fight at a time, beating one man at a time. "Whatever happens, happens, but I know with the team I've got around me, and the way that I'm improving in the gym, that these sort of fights and these sort of accolades aren't out of the question at all." Gill must firstly overcome Dominguez, a battle-hardened Mexican, whose sole stoppage loss came at the hands of current WBO super-bantamweight champion Emanuel Navarrete. "He's experienced. He's only been stopped once and that's by a current world champion as well, who just beat Isaac Dogboe for the WBO title," said Gill. "He's been around, he's seen a lot of things in the ring, and I don't think he's going to be too bothered about coming over to England and facing me. It's going to be a fun fight, and the fans are in for a treat I think."